Anyone who has ever built a new bike, or built a bike for someone else, has faced the fact that they don't have pedals yet, or a pedal handy to work through the shifting and derailleur set-up. Spinning the crank is, of course an elemental aspect of the tuning process. The DP-2 Threaded Dummy Pedal is an incredibly useful tool, especially for shop or race mechanics. 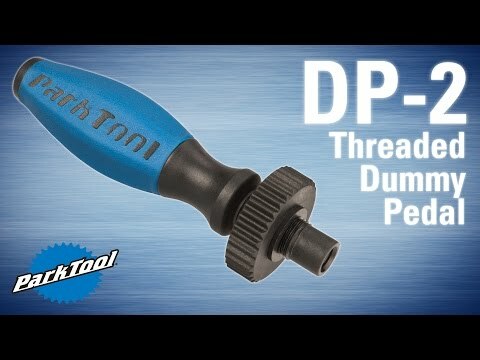 It's threaded "axle" has a piloted tip, and a short section of polymer threads that deliver a positive thread engagement, so you can leave the tool in place while working, unlike the Friction Fit DP-1, which has no threads. A polymer knob, with a ridged surface makes it easy to spin the axle in, and it features a small stop lip that keeps even the most expensive crankset completely protected from any interaction with the tool beside the threading. Simply insert the tip, and thread into the driveside crank arm, spinning the knob clockwise. You don't need to crank it down, and when you are done you will able to easily spin it off counter-clockwise. The free spinning handle itself is ergonomic and slip resistant, even when greasy, so you can quickly and smoothly get the crankset up to the desired cadence for shifting through the drivetrain. Simple, safe, inexpensive and effective, so every mechanic can easily justify having a DP-2 ready for the next build.